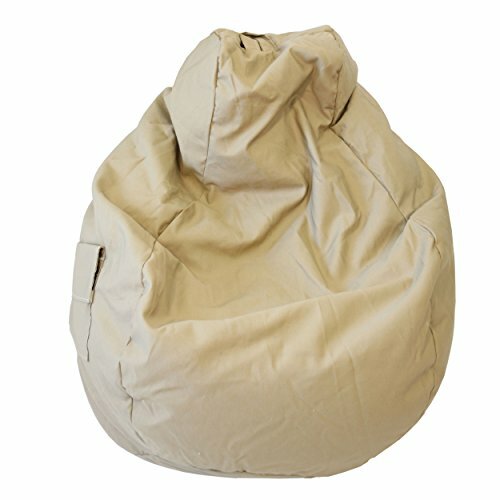 The Large Khaki Denim Tear Drop Bean Bag with "Cargo Pocket" is Sturdy, Double Stitched, has a Child Safe Zipper. 112" Circumference (L35" x W34" x H27"). Ideal for Teens, College, Gamers, Adults. The Convenient Cargo Pocket is Perfect for your Cell Phone, Remote Control, Books, Magazines, etc. The Tear Drop Shape Conforms to each Individual and Provides Extra Back Support. This Durable Bean Bag is Made in USA and has Easy Spot Clean Maintenance. Filled with Virgin Expanded Polystyrene Beans.